Collaboration among health care professionals is key to delivering better care to improve the patient experience. The Center for Interprofessional Practice, Education and Research (CIPER) is the catalyst for interprofessional education and practice for Creighton University and CHI Health, our primary academic health partner. CIPER is part of the Nexus Innovations Network supported by the National Center for Interprofessional Practice and Education. This innovative enterprise, one of the first in the nation, ensures students in Creighton’s health sciences programs receive an interprofessional education that prepares them to collaborate and share knowledge with other health care professionals in their future careers. Our IPE courses and tools are also made available to educators, clinicians and students outside Creighton. Students complete interprofessional education (IPE) activities and courses. Through the new CHI Health Creighton University Medical Center University Campus, health sciences students at Creighton can put their education into practice in everyday situations with real-time decision making. The Center for Interprofessional Practice, Education and Research provides IPE tools and resources as well as IPE and Interprofessional Collaborative Practice (IPCP) courses for clinicians, faculty and students of the Creighton community. *CED 400 and IPE 400, below, are designed for Creighton faculty & clinicians and Creighton health professions students. Please see IPE 004 and IPE 400 courses which are designed for non Creighton clinicians/faculty and students. The Interprofessional Education Passport consists of student learning activities focused on meeting the core competencies for interprofessional collaborative practice and each profession’s interprofessional education accreditation requirements. Interprofessional education is defined as “when students from two or more professions learn about, from and with each other to enable effective collaboration and improve health outcomes” (WHO, 2010). As a Creighton health sciences student, you must complete three IPE Passport activities to graduate. Prior to enrollment in the IPE Passport, you must successfully complete IPE 400: Introduction to Collaborative Care. In order for an activity to be approved as part of the IPE Passport, it must meet certain criteria and be approved by the IPE Curriculum Committee. This is an online, self-paced faculty development course designed for Creighton faculty or clinicians desiring a basic introduction to the concepts of IPE and IPCP. The course provides eight (8) CEU/CME approved by Creighton University Health Sciences Continuing Education, which holds joint accreditation from the Accreditation Council for Continuing Medical Education, the Accreditation Council for Pharmacy Education and the American Nurses Credentialing Center. See IPE 004 for non Creighton clinicians and faculty. Lesson 1: What is IPE and Interprofessional Collaborative Care? Lesson 3: What is a Team? The course is open to Creighton faculty or clinicians including dentists, emergency medical services personnel, nurses, nurse practitioners, occupational therapy practitioners, pharmacists, physicians, physical therapy practitioners and social workers. ​Registration questions? Contact the CIPER office at 402.280.5270 or email CIPER [at] creighton [dot] edu. *CED 400 is designed for Creighton faculty & clinicians. For non Creighton clinicians and faculty please register for IPE 004. This course is an online, self-paced course for Creighton health professions students that provides a basic introduction to the concepts of IPE and IPCP. The course is designed to be .5 credits or 8 contact hours. Please see IPE400 for non Creighton students. The course is integrated with cases for application and knowledge growth. More than 900 students from across seven professions have taken the course. Results from the Team Skills Scale demonstrates significance in all areas of team skills. Student feedback has been overwhelmingly positive. Registration: for Creighton health professions students Contact the CIPER office at 402.280.5270 or email CIPER [at] creighton [dot] edu. For non Creighton health professions students: Register. IPE courses are approved through the IPE Curriculum Committee, an interprofessional team of faculty that have expertise in the interprofessional field. A common syllabi template has been drafted to be used for all IPE courses within the Health Sciences. This ensures a clear approval process cycle with curricula assessment and outcomes identified. The common syllabi template ensures all criteria for IPE and accreditation(s) have been met. Educators, clinicians, researchers, policy makers, learners. I recently completed my practice observation at CHI Health University Campus and I was blown away by the interprofessional model at the clinic. I was amazed by the teamwork, communication and camaraderie. 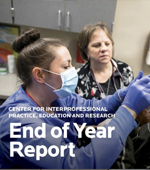 See the Center’s latest accomplishments and plans in the integration of practice, education and research, in our End of Year Report (2018).